Miffy mania continues to take hold in the Beesley household following our recent trip to the Miffy Museum in Utrecht. Whilst there we stocked up on lots of Miffy goodies and thought ahead for Christmas and have secretly bought Miss T some extra Miffy themed Christmas treats. Having travelled hand luggage only, we found it quite a squeeze to fit in all our Miffy shopping to bring home. 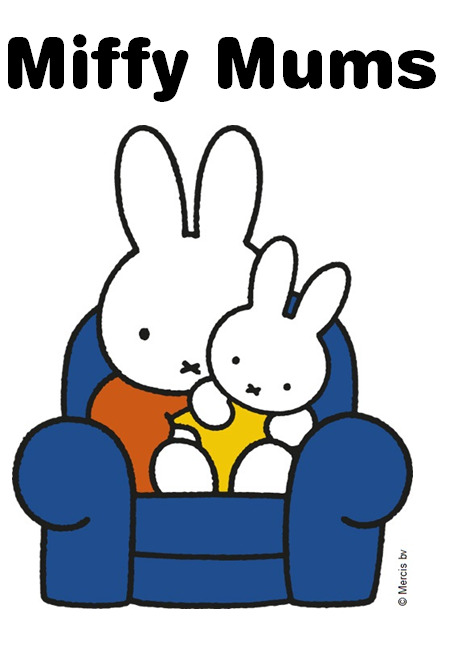 I only wish that we had realised just what a massive selection of Miffy products were available right here in the UK via the Official Miffy Shop. The kind folk over at Official Miffy UK had specially chosen this Miffy Farm Puzzle for Miss T. Puzzles are just brilliant for kids to learn problem solving skills as well as for hand-eye coordination and improving dexterity and motor skills. When the boys were younger we had a huge range of puzzles for the different ages and stages of development which we have long since passed on to friends. Miss T had outgrown those wooden peg style puzzles and wasn't yet up to doing the smaller pieced puzzles and we didn't seem to have any puzzles suitable for 'early years' stage. 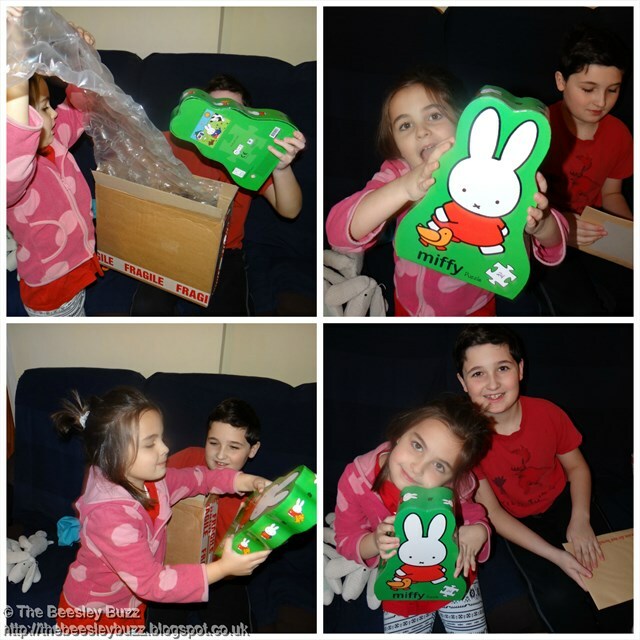 So this Miffy Farm puzzle with it's chunky 24 pieces was just perfect! And was extremely proud of herself when she completed it! I have to tell you that of course I love the bright colours of this puzzle, I love the picture (not too easy nor difficult), I love seeing Miss T enjoy working out where the pieces go and managing to fit them together. But one of the things I love the very most about this puzzle is the packaging. It comes in a super sturdy box that will last as long as the puzzle itself. 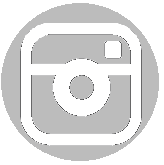 One of my biggest bugbears when it comes to children's toys and games is that however good the game or toy is, the boxes are often flimsy and tear or wear out quickly making storage of that toy really tricky. Not so with this robust puzzle box. It's also Miffy shaped for added interest and fabulously bright and colourful too. We absolutely love everything about this puzzle! You can find the Miffy Farm Puzzle in the Official Miffy UK shop and you can also follow Miffy UK on Twitter and on facebook to find out what Miffy is up to. Disclosure: Miffy UK sent us this puzzle for the purposes of review. All opinions are our own. Regular readers may remember us reviewing Super Mario Maker when it launched on Nintendo WiiU. Now those clever people at Nintendo have created the Nintendo 3DS version... and it doesn't disappoint! Just like the WiiU version, Super Mario Maker for Nintendo 3DS is essentially a game creator. You can build your own Super Mario levels, placing coins, enemies and even Bowser himself. You can change the theme of the level, and play through the different eras of Mario. Similar to the WiiU version, but with even more options - the only limit is your imagination. And there's plenty of help to be had, including lessons on how to create courses - even giving you the choice of learning the basics, or the more advanced aspects of course creation. 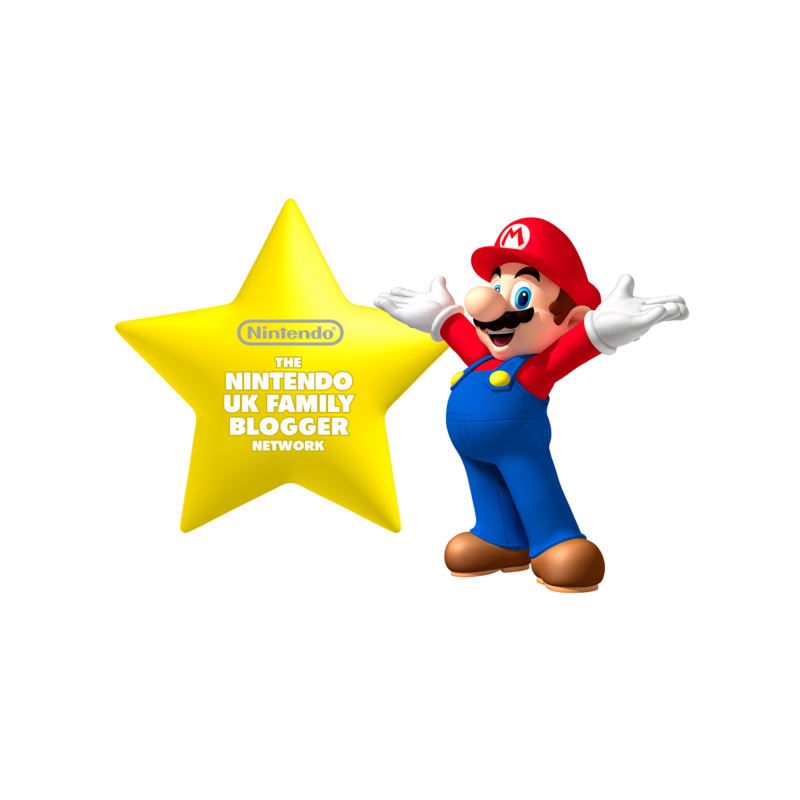 One of our favourite features is the Super Mario Challenge. Each of the 100 courses built by Nintendo in the Super Mario Challenge will reward players with two medals for completing courses in a specific way. These challenges range from tasking players to finish a course making sure they only defeat one kind of enemy, reaching the goal without ever pressing the jump button, or making sure every coin has been collected. But you don't get to see the second challenge until you complete the first. This means the levels never get old - there are multiple challenges (some very tricky!) to keep them fresh and exciting. As with the WiiU version, you can share your courses with others, and download courses that other people have created, so there will never be a shortage of new levels to play. All course creation elements of the basic set are unlocked from the start, with additional course elements unlocked by completing worlds in Super Mario Challenge. So the more you play, and the better you become, the more complex your own courses can become. Of course, one of the best things about the Nintendo 3DS is that it is portable - so Super Mario Maker for Nintendo 3DS means you can create courses whilst out and about, taking inspiration from the world around you. Super Mario Maker for Nintendo 3DS is a fantastic addition to our gaming, and the boys have loved both building courses and testing their skill in the Super Mario Challenge. Definitely recommended! As Nintendo Family Bloggers we were sent a download copy of Super Mario Maker for Nintendo 3DS for the purposes of review. All opinions are our own. Reborn is a teen fiction novel but one with a difference. I knew a teeny snippet of it being about angels before I began to read it. But it was way beyond my expectations. It gets stuck straight into the story to get you turning those pages right from the start. The story is told in the first person by Abigail - a teenager who survived a near fatal car accident against all the odds with, it turns out, the help of a guardian angel. And these ain't no ordinary angels - forget twee little cherubs... these are angels with attitude. This novel succeeded in being serious, fun, thought-provoking, and humorous all at the same time. It had just the right balance of love and romance without being over the top, mixed with elements of excitement and fear without being too scary. I loved the fun historical references reminding me of a certain time travelling doctor who also gets to meet certain great figures from the past. I read this myself and loved it despite not being the target teen audience. I'd be very happy for my nearly teen children to also read it and, in fact, I think they will want to straight after me. This is C.M. 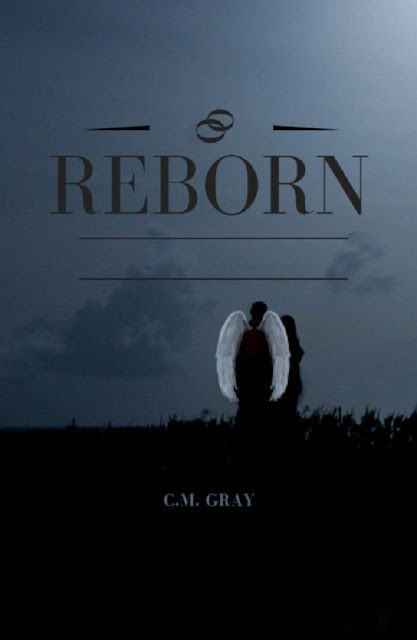 Gray's debut novel and I am so pleased that it is the first of a trilogy as I cannot wait to read more. It is available as an ebook on Amazon here at the brilliant price of just £2.37. (Price correct at time of publishing, as always please check prices yourself before purchase). Disclosure: I was gifted an e-copy of this book for the purposes of review. All opinions are my own, and I would happily recommend this book to anyone.